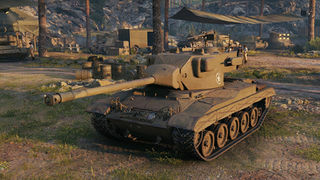 Der T37 ist ein amerikanischer leichter Panzer der Stufe 6. Der T37 führt zum T71 CMCD. When compared to the M24 Chaffee, the T37 is significantly slower and larger. However, it makes up for this for a huge boost in penetration and general gun stats, as well as increased HP pool. 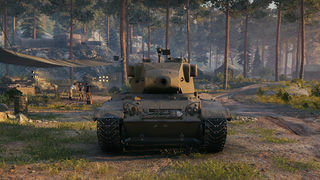 Although this tank can be played like its predecessor, using a scouting role, the T37's main strength seems to lie not in its scouting abilities due to worsened view range and camo, but its effectiveness in a supporting role with its excellent gun. 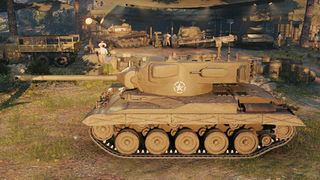 Autoloaded gun has lower penetration than 76mm T91, but faster burst damage. Use it to peek out and shoot few shots before taking cover. While the M24 Chaffee was a successful design, its main gun was not effective enough against well armored opponents. Although the primary mission of a light tank was scouting, the U.S. Army wanted one with more powerful armament. The development of the new tank, T37, began in 1947. The vehicle was designed to be air-transportable, and the desired anti-tank capabilities were provided by installing a long 76 mm gun with an advanced rangefinder. In 1949, with the adoption of a less ambitious rangefinder, the project's designation was changed to T41.